Kent Pietsch fell in love with flying when he was four years-old. Five decades later, his passion has not waned. Since 1973, Kent has performed his incredible aerobatic routines for millions of people at more than 400 shows that have taken him to quality venues throughout the United States. Kent grew up in Minot, North Dakota, where every day after school, he’d find a way to get to the airport, and do whatever it took to get into an airplane. 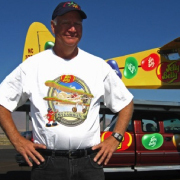 Kent’s humble nature and willingness to interact with fans make him a crowd favorite wherever he performs.He flies an 800-pound Interstate Cadet with a 37-foot wingspan. The plane’s horizontally opposed four-cylinder engine can generate 90 horsepower and a G-force ranging from -3 to +5.